Collapsed stars, exploding stars, windy stars, and dusty stars call for the missing element: electricity. A recent press release from the Chandra X-ray Observatory describes the image at the top of the page as, "...made up of gas and dust that condensed out of debris from the supernova." The glowing clouds are "...energized and heated by a shock wave from the supernova." Material blown away by the supernova explosion is said to be streaming at enormous speed past the other stars that were close by when the giant stellar mass collapsed and then rebounded, throwing its outer layers into space. Does that explanation correspond to observations? How is it that explosions inside clouds of hot gas create X-rays? As has been pointed out many times in previous Picture of the Day articles, stars are not simplistic globes of hot gas under pressure, they are composed of plasma. Plasma is ionized and is therefore an electrically charged substance. Since it is ionized, it does not behave like a pressurized gas, so shock waves and gravitational instabilities are insufficient when it comes to explaining the birth and death of stars. In the laboratory, plasma forms cells separated by thin walls of opposite charge called double layers. Could charge separation also take place in the short circuit discharges known as supernova remnants? That question might require centuries to answer, since the only way to detect a double layer in space is by flying a probe through one. However, everywhere in our own Solar System cellular structures separated by double layers abound: the Sun's heliosphere, comet tails, and magnetospheres are all examples of charge separation in plasma. As Electric Universe theory states, a supernova is an exploding star, but not in the conventional sense. Rather, it constitutes the explosion of a double layer in plasma. Star power comes from external electric currents flowing through vast circuits in space, so the radiation and “wind” from stars are due to arc discharges that vary in strength. It is those electric arcs that make up the stellar corona, chromosphere and photosphere of our Sun, for instance. Supernovae are the result of a star effectively “throwing a switch” in the galactic circuit. The result is the same as an unintended circuit break in an earthly power grid where the stored electromagnetic energy in the entire circuit is suddenly focused at one point. In an exploding double layer, the energy of an entire circuit might flow into the explosion, increasing its expansion far from the surface of the star. Radiation from the double layer is pushed into ultraviolet or X-ray wavelengths, emitting bursts of high-energy light. Shock waves and heat (infrared) are not the principle evidence for such an occurrence, they are the secondary manifestations of a primarily electrical event. The roughly concentric and radial filaments of G54.1+0.3 suggest that the telescope is looking down into the cylindrical formation of an interstellar Birkeland filament that is pinching into an hourglass shape and powering the excessively bright central star. The Chandra team's analysis of the temperature is also most likely questionable. Thermal energy is created when atoms collide with each other. The various infrared wavelengths emitted from those atomic collisions correlate to their temperature. However, most radiant energy in space is synchrotron radiation produced by electrons as they travel through a magnetic field. If electrons are moving they are called an electric current. An electric current in a magnetic field is defined as “field-aligned" and is known as a Birkeland current. Birkeland currents release synchrotron radiation, and synchrotron radiation provides no indication of temperature. It is electric currents in plasma that make up what we observe. Rather than an expanding shock front of gases, the features shown in the Chandra image are lit by electricity passing through the dusty plasma. 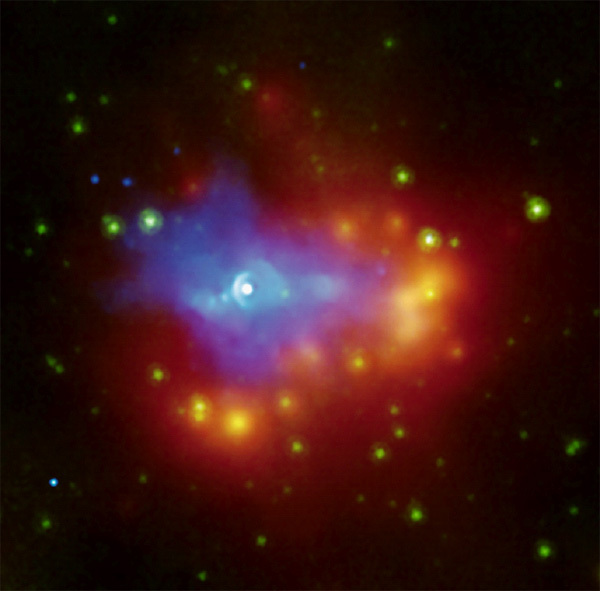 The X-ray radiation is typical of that given off by highly excited stars, indicating extremely strong electrical stress.